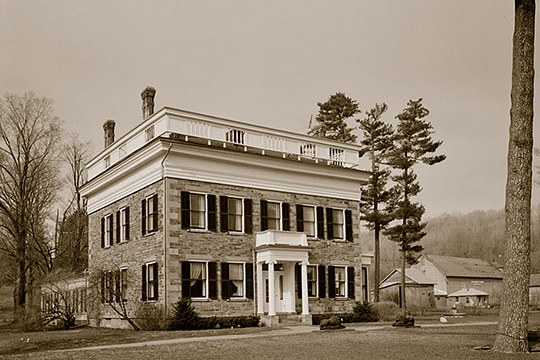 Photo: Samuel Gilbert Hathaway House (Hathaway Hall), ca. 1844, Solon Road, Cortland, NY. Photographed by Jack E. Boucher, 1966, Historic American Buildings Survey [HABS NY-5592], memory.loc.gov, accessed December, 2014. The Cortland County Courthouse is located at 60 Central Avenue, Cortland NY 13045; phone: 607-753-5052. Cortland County is located in the geographic center of New York State, mid-way between the City of Binghamton to the south and Syracuse to the north. As the northern terminus of the Appalachian region, the County's topography consists of small mountains, rolling hills, gentle valleys, and an abundance of small lakes and streams. The primary County waterway is the Tioughnioga River, which flows southward from the County's northern border, eventually flowing into the Susquehanna River. Cortland County is relatively small, with only 502 square miles. The County consists of 19 municipalities, including 15 towns, three villages, and one city. The City of Cortland, the County's largest municipality, is located in the central western portion of the County. Most development is located in and around the City with those communities to the north, east, and south of the City being primarily rural in nature. Interstate 81 bisects the County, following the route of the Tioughnioga River, and is the major north/south route through the County. Much of the early settlement of Cortland County was military tracts, lands awarded to Revolutionary War enlisted men. The County was originally part of Onondaga County to the north but was eventually established as a separate entity in 1808. Although at the time there was much controversy over where the County seat would be located, eventually the City of Cortland was chosen, primarily due to its excellent trade location on the Tioughnioga River, the County's main waterway. The City of Cortland and the surrounding township of Cortlandville eventually became home to the County's "smokestack" industry where a number of locally originated industries established themselves. The County's three Villages, namely, Marathon, Homer, and McGraw, while not nearly as large as the City, established a mix of residential structures, retail businesses, and small industrial concerns. All four municipalities eventually established successful "Downtown" areas that were primarily self-sufficient. The three Villages were also supported by surrounding farms that provided an economic livelihood based on milk production and food supplies, tanneries, gristmills, and other farm-related businesses. The surrounding townships, 15 in all, were primarily agricultural. Most of these townships established small hamlet areas that consisted of post offices, local schools, hotels, mills, and general stores. Eventually the railroad became a major presence in Cortland County, connecting Cortland County communities and moving goods and services in and out of the County. After World War II, with a heavy reliance on automotive transportation, those who desired employment found ample opportunities in the industrial center of the County, namely, the City of Cortland and the surrounding Town of Cortlandville. New housing initiatives, strip malls, and supermarket chains also were established in this area of the County. Concurrently, there began a slow and steady consolidation and decline in the farming industry, and rail service dramatically decreased. In the 1960's, New York State constructed Interstate 81 through Cortland County. At the time, there was much discussion as to where the interstate would be placed. Its eventual location served to facilitate the industrialized western area of the County further bolstering this portion of the County as its economic hub and rendering outlying areas as primarily bedroom communities. Cortland County Consolidated Plan, October 2002, www.cortland-co.org, accessed January 2009.